1. Fill a large pot up (2/3 of the way) with water and bring it to a boil. Add noodles and cook for 8 minutes (or follow directions on package). Drain noodles when done and cover in ice. 2. While noodles are cooking, coat a large skillet with 7 grams (1/2 tablespoon) oil and heat over medium-high heat. Once hot, add chicken and top it with 7 grams (1/2 tablespoon) oil, 1 teaspoon salt, and pepper. Let sear for 5 minutes then flip and sear for 3 more minutes. Pour 1/4 cup of water in skillet, reduce heat to medium and flip chicken one more time. Cook for 5-7 more minutes, or until chicken is no longer pink in the middle. Cut chicken into bite-size pieces. 4. In a large pot set on medium-high heat, heat the milk and cheese together for 5-7 minutes stirring constantly. Once cheese is melted, stir in the salt, pasta and chicken. 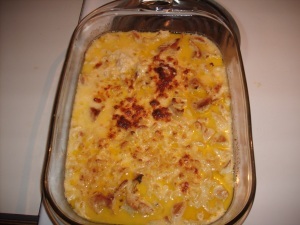 Place in a 2-quart casserole dish. Broil on high for 10-15 minutes or until bubbly brown. It’s mighty hard to mess up mac & cheese, but I managed to do it on my first time around, so instead of focusing on the disaster that my first batch was, I’m going to tell you what I did to make it what will undoubtedly go down in history as BETTER THAN YOUR GRANDMA’S MAC & CHEESE. 1 – Don’t melt the cheese prior to putting it in the oven. I think this where I went wrong big time, causing the final product to come out a bit thin and watery as opposed to thick and gooey. In my second batch, I simply added the cheese on top of the macaroni before putting it into the oven. 2 – Bake first, broil last (if at all). This is a personal preference, but it turned out well. Instead of broiling, I put everything into the oven for about 20-25 minutes on 375 degree, but if you want that nice lightly brown top crust, you can broil it for a few minutes after removing it from the oven. This recipe was found in Leigh Peele’s Bulking cookbook which can be purchased here. It also features another 20+ delicious, high(er) calorie recipes for those who are looking to put on some muscle or just like eating larger dishes. Even if you don’t, you can always divide the recipe up into smaller portions. Affiliate note: If you purchase any of Leigh’s cookbooks by clicking the links on this page, I’ll get a small portion of the sale, but this in no way biases my review. I’ll never promote something on this site that I haven’t used personally or that I don’t think will be a great benefit to you all. That is my promise to you, and if you ever catch me trying to pull a fast one on you, PLEASE feel free to evict me out of my home and force me to live on the streets with access to nothing but a 1990s tape player and a spoon. Why the spoon? I have no idea, but I’d much rather have a fork, so it must be punishment in some way, right? I’ll definitely be making this dish soon, but I’ll opt for a lower cal version by tossing out the oil, half the cheese, and using skim milk and whole grain noodles (rotini probably works well). Side note: You can actually get this cook book for free (now called Refeed) in the member’s section of Leighpeele.com. Bulking…bulking…hmmm. What is this bulking that you speak of? Made this for the family last night. Added a package of frozen broccoli to it…because, well you know….mom still makes me eat my vegs from afar. 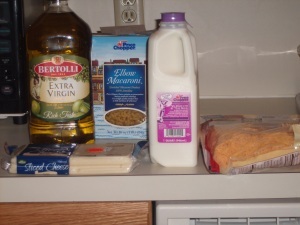 Probably would cut down on the milk and maybe add some extra cheese, overall really good though. You don’t want to anger The Patti – she is all knowing and all seeing. The next time I try it I’ll try out your suggestion – more cheese is never a bad thing.